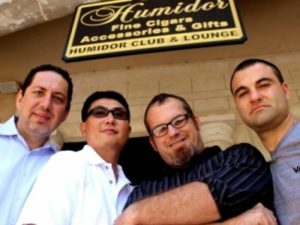 If you’re looking for a Cigar Shop in Palm Coast to buy fine cigars at, or a Cigar Bar and Lounge in Palm Coast to sit back, relax and enjoy a cigar in, then The Humidor is you. Established in 2005, THE HUMIDOR CIGAR BAR AND LOUNGE is one of the handful original establishments at the European Village. This Cigar Bar and Lounge offer offers a terrific atmosphere to kick back and relax, connect with others, and enjoy a beverage (a cold craft beer, a quality glass of red or white wine, or a beer fusion cocktail) to pair with a premium cigar. This Palm Coast Cigar Shop, Bar and Lounge features a carefully curated cigar selection spanning over 100 brands. You can find cigars from well known brands like Padron, Cohiba, Macanudo, Davidoff, Avo, Zino, CAO, Camacho as well as small-batch cigar makers like Cordoba Morales, Esteban Carreras, AJ Fernandez, Nestor Miranda, and others. The bar serves about 50 craft beers, 4 draft beers from Florida on tap, as well as red and white wine, port and mead. For upcoming events visit The Humidor Facebook page.